I’m very back logged on writing right now! I apologize and promise more to come. I’ve made a platform bed from Ikea bookcases (still need to do the headboard), sewed some baby clothes for a colleague, have joined a couple of sew-alongs (new work tops on the way), and am nearly done with a simple sleeveless dress. Tonight, got supplies laid in for a chocolate strawberry cake I promised another colleague. It’s not a single-evening cake, especially when I’m not getting home until well after 7, but there will be a post. Probably Saturday for that one. Not enough birds! But, Scruff has set up a webcam for me, that auto-answers a Skype call – I can call any time, and it will turn on and I’ll be able to see whatever’s at my feeder, even when I’m not home!! How cool is that?! 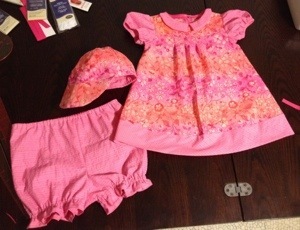 Here’s a photo of the baby outfit. I’d never sewn seersucker before and found it quite enjoyable to work with (now I think I need a summer top out of seersucker!). The little hat reverses to the stripe like the bloomers. More of a pattern review in another blog post later. Sorry about that “Redirect Loop” message you may have been seeing. The hosting provider made some requested account changes, but mistakenly set things up so that anyone trying to reach BirdsOfAKettle.com would be redirected to BirdsOfAKettle.com. You can see where that might be a problem…. It’s fixed now and the site is back online. Happy reading! Wow. I was researching some equipment selections for my Bonneville and somehow came across this piece by Wendy Moon. What an incredible piece of writing. I am thankful I have no “tIM” in my life, but the rest… definitely pause for thought! I have also been too much a passenger in my life, although that changed a few years ago. I agree one of the reasons I love my LME (pronounced Ellemy – the name for my Bonnie) so much is exactly the feeling of being in control of my own experience, and the feeling of being “in” the world as I drive through, not isolated from it – believe me, 60 mph on a stock Bonneville is not at all the same experience as the same speed in a Prius, or any other car I’ve ridden in or driven. As I’ve gone through various events in my life, some good, some less so, but hopefully all learning experiences, I find more and more that I “need” less and less. While Project 333 isn’t quite a reality for me yet, I’m inspired by it in many ways, along with reading a few minimalism blogs (like The Other Side of Complexity, zen habits, and The Miminalists). The immediate focus the next couple of weeks will be sewing! The Original Sewing & Quilt Expo is coming up in about another week, which has me really excited to warm up the Juki! I’ve given myself a goal to end up with 50-80% of my clothes being made by my own hands, starting with a few tops, and learning to do pants. However, in spite of that goal…. I’ve yet to take a sewing class! I know the expo classes are pretty short, comparatively, but in two days I get to take 9 different classes/seminars on various aspects of garment sewing! As a pretty-much-self-taught, calling-older-sister-over-the-phone-taught-sewist (which BTW, seems to have become the preferred term over sewer or even seamstress)…. this is very exciting! Stay tuned for reports and adventures! 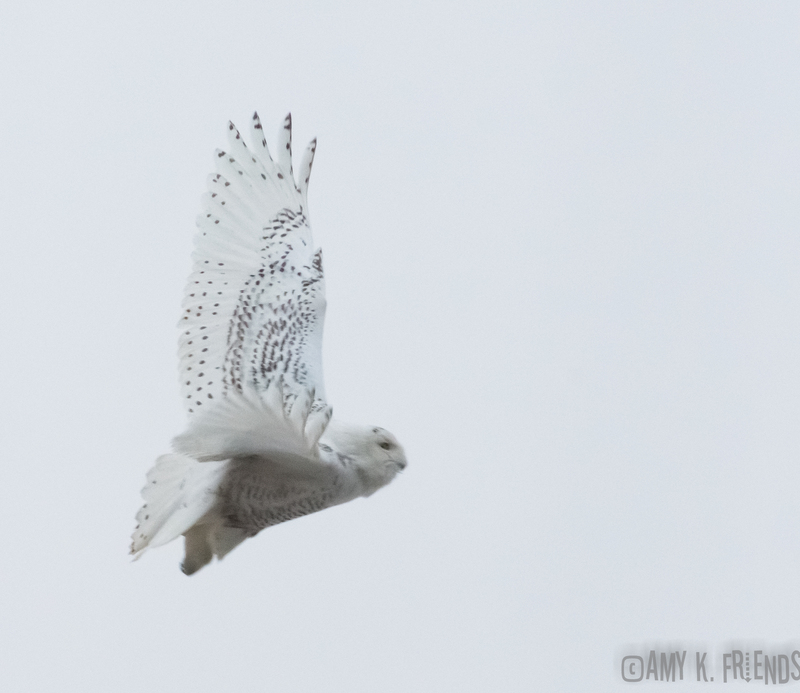 If you’ve been keeping up with the news lately, and you’re anywhere on the Atlantic coast, you may have heard about the Snowy Owl irruption. There’s an abundance of lemmings this year, leading to an abundance of Snowy Owls… and when there are too many they move south to look for more territory. Of course as it warms they’ll head back north but for now… they’re in “all the wrong places” and you might just get lucky enough to see one (or two, or three, or heck, if you’re near Assateague I hear there are five!). 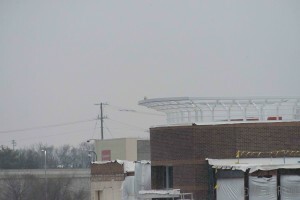 In any case, as several attempts to see a Snowy Owl in DC (which I later learned was hit by a bus, put in rehab, and is doing well (follow her on Twitter @DCSnowyOwl), I found out that there was another one hanging out at, of all places, the mostly-closed-for-renovations Springfield Mall in northern Virginia. 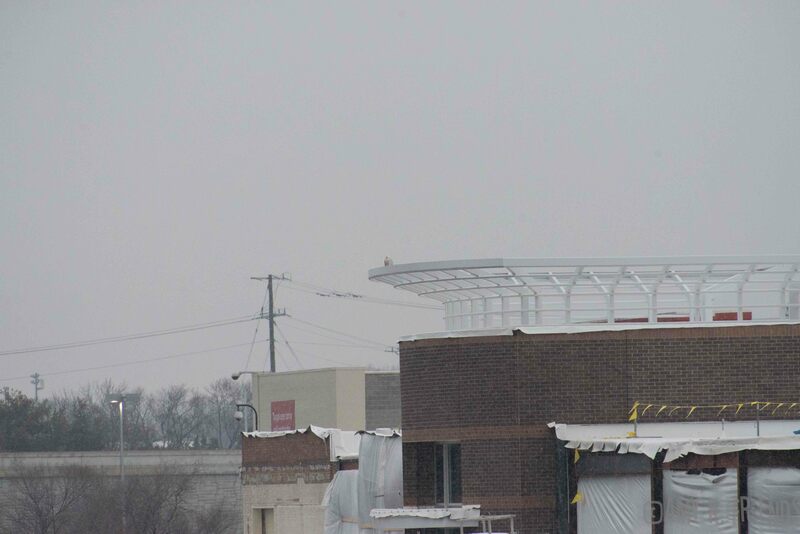 For those of you not local… Springfield Mall is in the heart of a massive DC suburb with a set of highway ramps unaffectionately known as the mixing bowl. Not really a place you’d expect to find a stray Arctic wanderer, but hey, I’d seen photgraphic evidence! Scruff drove me down on a Friday evening. We spent two hours circling the mall, with no luck – it had been the Tuesday night, Wednesday night, and Thursday night! I heard the next day it was seen again on Saturday, so Sunday I drove down myself and spent the hours just before sunset driving around and around the mall. I drove to the top of several of the parking garages, when suddenly, in a mall with only three stores open and pretty-much-empty garages, I saw about 5 cars on the top level. I knew immediately I was about to see a Snowy! I parked, and went over to a couple with binocs, and they helpfully pointed out where the bird was perched in the distance (birders are friendly like that). Last week a colleague had a birthday coming, and the group’s tradition is to have the birthday person choose take-out, then we put in a group order, with the others buying the birthday person’s lunch, and someone tries to make a dessert the birthday person would like. This time, it was carrot cake, and when the holler over the cubicle wall “Amy, do you know how to make carrot cake?” came… this recipe immediately came to mind. 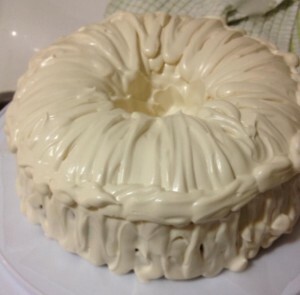 Everyone seemed to like it, and plus, my husband hadn’t ever had my carrot cake, and since I made him one too – I was granted “bestest wife ever” status! LOL If you like a carrot cake with LOTS of carrots, give this one a try. Combine Step 1 ingredients in a pot and bring to a boil. Cook 5 minutes then remove from heat and let cool completely. Whisk all Step 2 ingredients in a bowl large enough to hold the dry stuff, and later, also the carrot mixture. Be sure you’ve preheated the oven, then grease and flour a Bundt cake pan. Beat the egg, then combine all Step 3 ingredients together and stir them into the carrot mixture. Add the carrot mixture to the bowl of dry ingredients and mix just until you don’t see any more dry flour. Transfer to the Bundt pan. There may be a smidge too much batter, so you might a need to fill a couple of muffin cups or something. Bake approximately an hour, until a knife test comes out clean. Let cool 10 minutes in the pan, then invert onto a serving plate and let cool completely. Beat first three ingredients until smooth and light. Stir in the confectioner’s sugar with a spatula until it’s mostly incorporated, then beat with and electric mixer until the mixture holds stiff peaks, then put it on the cake however you like. Depending on how much icing you like, this may be halved. It’s easy to say “I’m going to eat well this week”… But when you’re sick, tired, sick and tired, or just out of your routine, eating out seems easier. I wish it didn’t, because in reality, it probably takes just as long to get a table, order, and have it delivered to you, as it does to make something. But while restaurant food can taste good, statistics show the likelihood of it actually being good for you are very slim. Last week I ate lunch out a few times last week, and while the sandwiches were tasty, I noticed I was much hungrier in the evening than after my self-prepared lunches. Probably the lack of fiber, but in case, I vowed this week to get my lunches made in advance! So over the weekend I spent an hour and a half and made 9 salads, five full size for myself, and four smaller ones for my husband, who usually has a sandwich with it. Mine are pretty big (like my friend Rii, I’ve taken to inviting “Hugh Jass” to meals on a regular basis): greens, zukes, cukes, peppers, black beans, steamed broccoli, carrots, roasted beets. They take me a bit of time to eat, but I stand at my desk all day anyway! I’m way less likely to have that afternoon energy lull when I have these. I’m trying to remember that, LOL, when I just don’t feel like spending the time to make them. It’s nice during the week when I can just grab a box, too! When Scruff and I got married, he didn’t have a dryer in the house. He isn’t necessarily opposed to dryers, but hadn’t had one in about 15 years. Partly because he couldn’t make one fit in the basement, partly because he was getting by without, so why bother? By measurements, it fit in space we created for it next to the washer. The delivery folks had had no problem getting the washer into the house; however, the dryer wouldn’t fit through the outside door and couldn’t be brought in. I’ve now gone 4 1/2 months without a dryer. A couple a times we’ve gone to the laundromat to dry my washing… but not very many. Hanging seems to work ok, but I will be researching better racks for sheets. Towels and clothes are a little “crispy” hung to dry, which I’m sort of getting used to (and honestly, the crispness goes away as you wear or use the item). I’m beginning to think I don’t need one after all. It fits more with my environmentalist tendencies, and Scruff doesn’t mind either way…. so for now, we’re not getting a dryer. 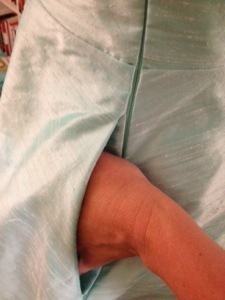 My concern – and if you sew, please proffer opinions! – is prewashing yardage. I’m thinking that they may need to go to the laundromat dryer once, to get the preshrinking in. And I’d like to sew more with wool… I’ve heard a steam dryer is great for pretreating it. What would be a good alternative? Watch this site for bird photos too! I used to have a large number up on a blog that was hacked, and I don’t have many up now, but I plan to add more. In the meantime, it’s Superb Owl Sunday!!! 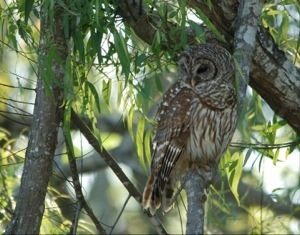 Whoo-whoo-whoo’s your favorite?